One drawback of all of my recent work and travel is less time for other pursuits. Case in point: It has been a long, long time since I did any serious hacking. And like any habit, after a while, the ‘jones’ gets to be too much to bear. Curiosity got the better of me and before I knew it I was in my local big-box retailer shelling out hard-earned dinero for fresh pristine hardware, ripe for reversing. UART Serial on the cartridge socket. UART is on the same pins as on previous LF1000 devices, which claude first documented on Didj way back when; so Moogle's DJHI breakouts will probably work fine. (I haven’t tested this yet) Edit: If at first the device doesn't boot with DJHI inserted, simply re-seat the DJHI and try again. UART Serial on J5 – VCC, Rx, Tx, Gnd - this looks to be similar to the J5 on the Leapster Explorer. USB - The pin header, J34, to which the camera was attached, is USB Device. Pins 2 and 3 on J34 are D+ and D-. Pin 4 is GND and Pin 5 (square) is VCC. Here are the mainboard scans for the front and rear (and the rear following removal of the CPU and cartridge socket). Images/content licensed under a Creative Commons Attribution-ShareAlike 3.0 Unported License. Managed to get to a Linux shell prompt by UART booting a zimage based on the Leapster Explorer kernel source and an initramfs containing a custom rootfs and modules that support SD/MMC cards. Uncompressing Linux............................................................................................................................................... done, booting the kernel. Augen eGo OE-A732 TV-Out pads! 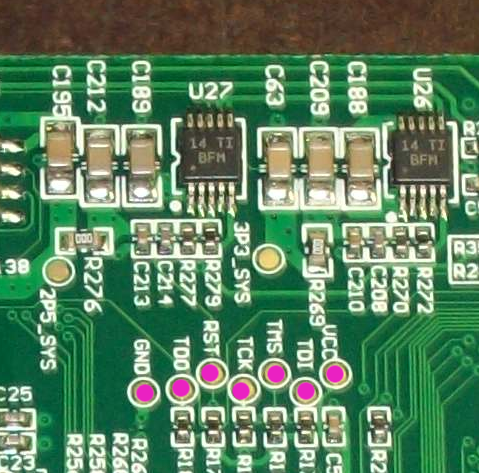 Found JTAG pads on the Augen eGo (matching the Pollux BGA grid map). The Leapster Explorer, a Linux-based children's handheld, is the follow-on product to the Didj. 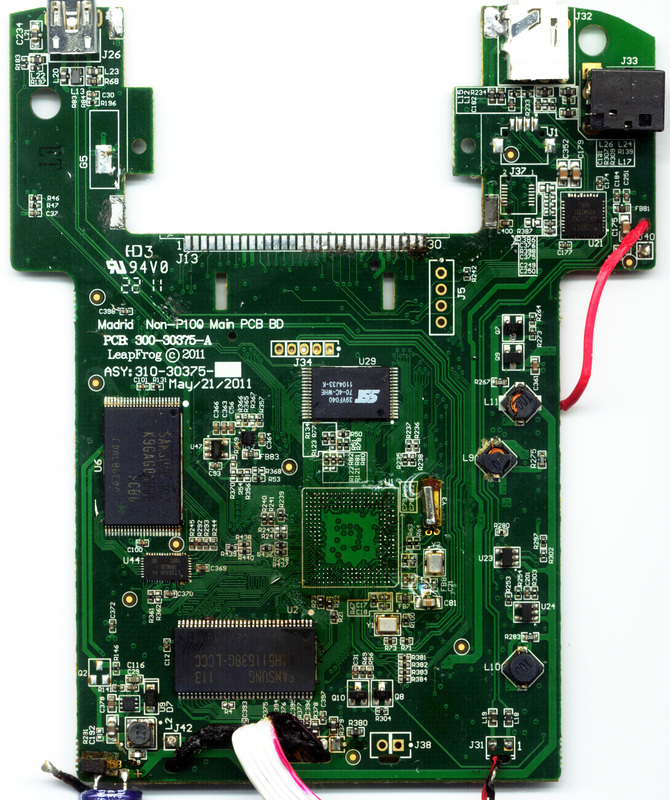 The Explorer runs the same ARM9-based SoC as its predecessor - one of our first tasks would be to uncover the Explorer's hidden TV-out mechanism. I managed to overvolt my first Explorer by sending 5v into the USB host pins just days after I bought it. So, I purchased a second unit and dedicated the dead unit to 'science'. After desoldering the mainboard, I was able to trace from BGA grid A2 (Video) to the test pad TP30 '-Right'. On my second Explorer, I soldered a short length of wire to TP30 and another to ground (cart socket), connected the ends to a composite connector, and modded the case. And a decent picture on my little test monitor. Thanks and greetz to everyone on #Didj (irc.freenode.org)!